Human IGFBP-7, His Tag (IG7-H5240) is expressed from human 293 cells (HEK293). It contains AA Asp 30 - Leu 282 (Accession # NP_001544). The protein has a calculated MW of 27 kDa. The protein migrates as 35 kDa under reducing (R) condition (SDS-PAGE) due to glycosylation. Human IGFBP-7, His Tag on SDS-PAGE under reducing (R) condition. The gel was stained overnight with Coomassie Blue. The purity of the protein is greater than 95%. 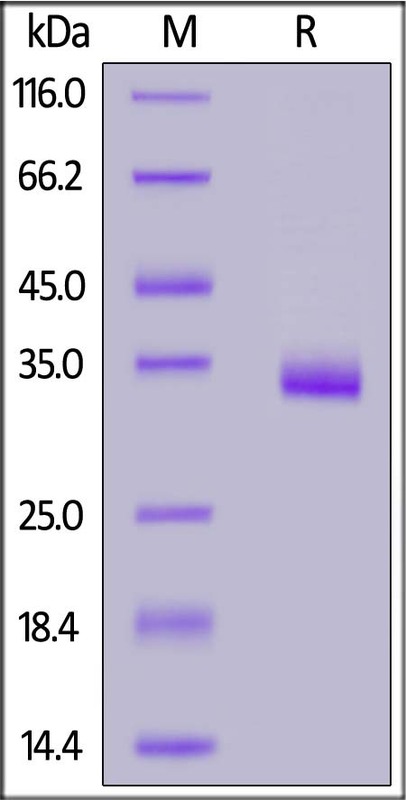 Insulin-like growth factor-binding protein 7 (IGFBP7) is also known as IGFBP-rP1, MAC25 protein, PGI2-stimulating factor, prostacyclin-stimulating factor and tumor-derived adhesion factor, which contains one Ig-like C2-type (immunoglobulin-like) domain, one IGFBP N-terminal domain and one Kazal-like domain. The major function of IGFBP7 is the regulation of availability of insulin-like growth factors (IGFs) in tissue as well as in modulating IGF binding to its receptors. IGFBP7 binds to IGF with high affinity except for IGF-I and IGF-II.IGFBP7 also stimulates cell adhesion. Furthermore, IGFBP7 is implicated in some cancers. (1) Yamauchi T., et al., 1994, Biochem. J. 303:591-598. (2) Oh Y., et al., 1996, J. Biol. Chem. 271:30322-30325. (3) Wilson E.M., et al., 2001, J. Clin. Endocrinol. Metab. 86:4504-4511.